You can identify the complexity of source code by using DT10. You recognize the complexity of source code and modify it; this will lead to improvement of software quality. After automatic Test Point insertion, open DTPlanner. Please select [Tool] ->[Open DTPlanner] in menu. Please check the number of Test Point in the function in a “step” field of a certain function. Test Points are automatically inserted in every branch. 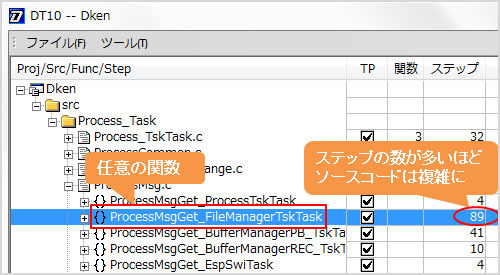 The ProcessMsgGet_FileManagerTskTask function in the following figure indicates the number of “step” is 89. You will notice this function is more complicated than the next function.